Day 2: We made it to San Diego! And it was not a piece of cake. 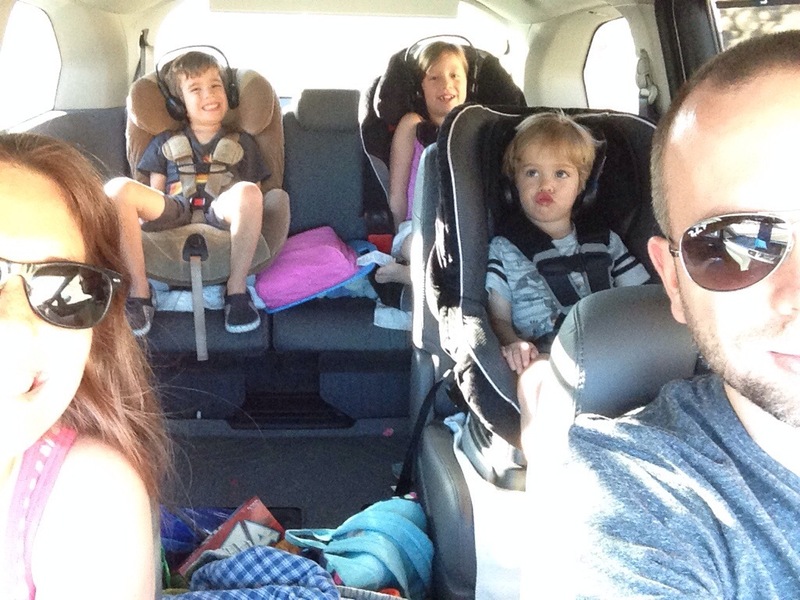 The kids were tired, the drive was boring, and I was cranky. Oh, and Ian hurt his stump yesterday and bruised it, so he started the day with a slight jerk in his step. Thankfully his leg is doing better. We are all excited to be here and start the real fun. As I’m writing this the kids are still in their bed wiggling and whispering, AND IT’S 11:15pm local time, which means it is 1:15am Texas time. They are crazy. Crazy tired! Me, too. 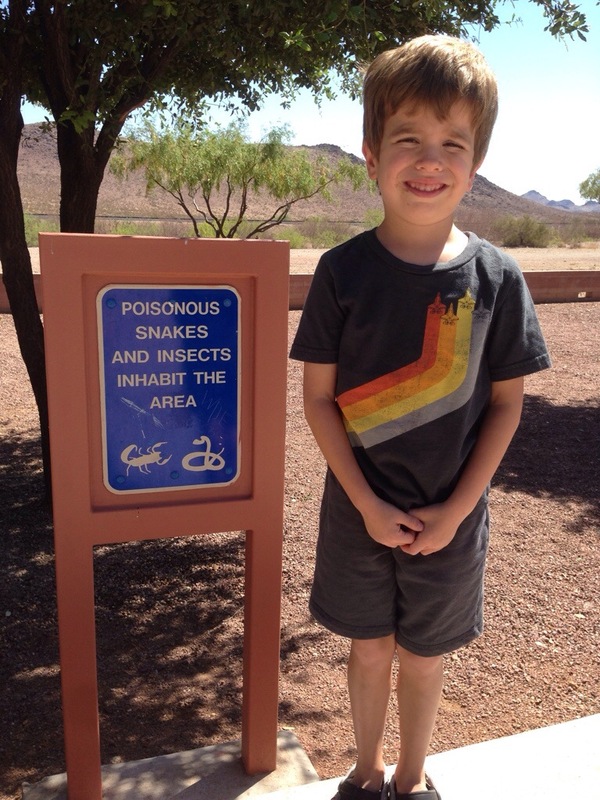 We stopped at a rest stop in Arizona and Jack spotted this sign. He loved it and had me take a picture to text his friend Dane. My eyes were glued to the ground all around us. My heart rate may have increased a little bit. We toured a large area of Tucson today thanks to Google maps. The kids needed to get some energy out after being crammed in the car all morning so we looked up the closest ChickfilA. (It’s the only playground restaurant with acceptable food.) Google maps graciously took us well into the city so our quick lunch turned out to be not so quick. Did you know they don’t have grass in Tucson? People’s yards are covered in rock or gravel. It’s not the most beautiful thing, but I envy that they don’t have to mow anything. Here’s a pic of us staying positive. Jack reached a bit of a milestone today. 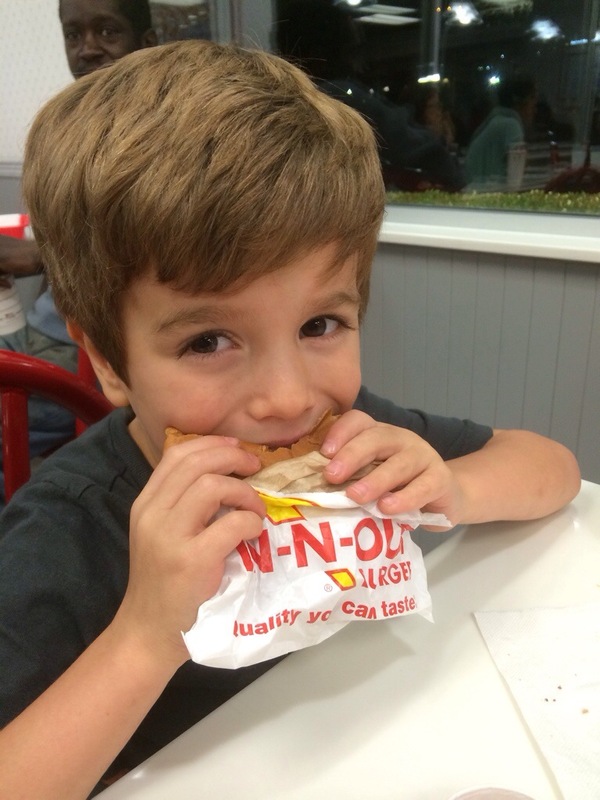 We had dinner at In and Out Burger and he had his first cheeseburger. Like, ever. He’s never been interested in trying one, but when they don’t have chicken or hot dogs somewhere you have to branch out. The good news is he liked it. I’m glad he’s willing to try new things. I’m off to shower and then bed. Hopefully these little lovies will be asleep when I’m done. Tomorrow is zoo day!!! Can’t wait! « Day 1: On the road.